Shadyside Train Station c. 1960. 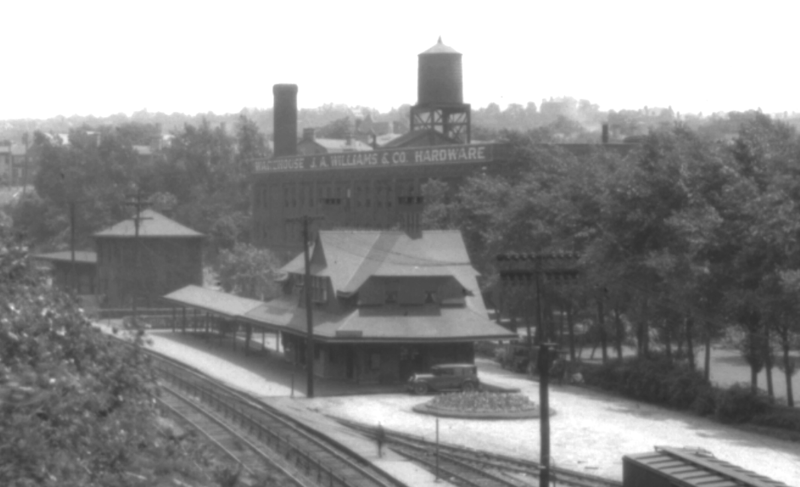 Above is another of the Shadyside Train Station images that Historic Shadyside reader David Wilson alerted me to. 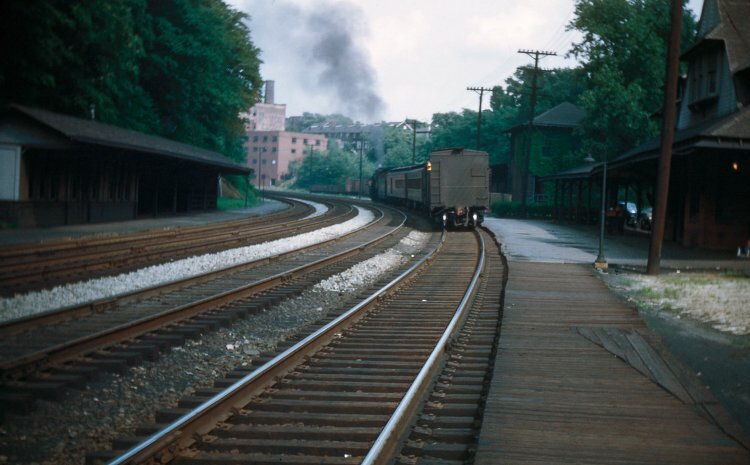 Read more about the history of Shadyside’s train station in my post “Shadyside Train Station and Pittsburgh’s Commuter Suburb.” The Shadyside Train Station was torn down during the 1970s. This entry was posted in Shadyside History on August 12, 2017 by don. Shadyside Train Station July 24, 1928. 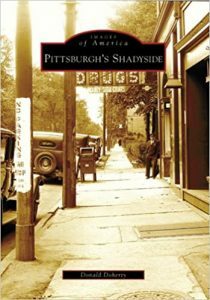 A detail from the image on page 112 of my “Pittsburgh’s Shadyside” book. Image courtesy of Historic Pittsburgh, the Digital Research Library at the University of Pittsburgh. Thomas Aiken was enthusiastic when modern transportation was built next to his farmland. On November 1, 1855 the Pennsylvania Railroad was complete between Philadelphia and Pittsburgh. Aiken’s farmland, reaching east to today’s Aiken Avenue and west to Neville Street, was close enough to downtown Pittsburgh for a businessman to commute in comfort on the railroad. Thomas Aiken and his son David lobbied the Pennsylvania Railroad to add a stop on their land. The stop was granted in 1860 and Shady Side Station was built in the early 1860s at the end of what is now Amberson Avenue. Shadyside Train Station July 28, 1949. Image courtesy of Historic Pittsburgh, the Digital Research Library at the University of Pittsburgh. The Shadyside Train Station was torn down during the 1970s but I was able to find a photograph of it during from 1928 (top image above). And now more images have turned up thanks to Historic Shadyside reader David Wilson. 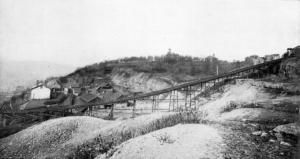 He found three more photographs of the station including the image above available from the Historic Pittsburgh site. Thank you David Wilson and to all my readers who have ignited great conversations and pointed to new resources! This entry was posted in Shadyside History on July 18, 2017 by don. St. James Place January 19, 1934 looking north across the Pennsylvania Railroad tracks to Shadyside Hospital. The buildings in the foreground at right were part of the Jesse C. Stewart Company development. At the time of this photograph the Shadyside Hospital was still a homeopathic facility. Its original building is at left. Straight ahead looking down St. James Place sidewalk and to the right was the newer medical and surgical wing. Image courtesy of Historic Pittsburgh, the Digital Research Library at the University of Pittsburgh. 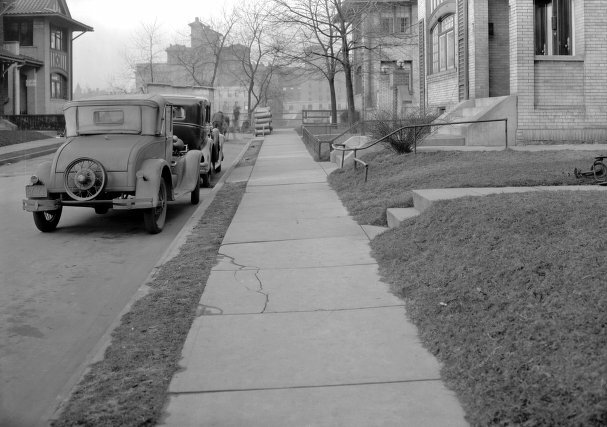 Above is an image of St. James Place in Shadyside from January 19, 1934. St. James Place is a short dead-end road off Ellsworth Avenue, close to and parallel with South Aiken Avenue (see the map below). 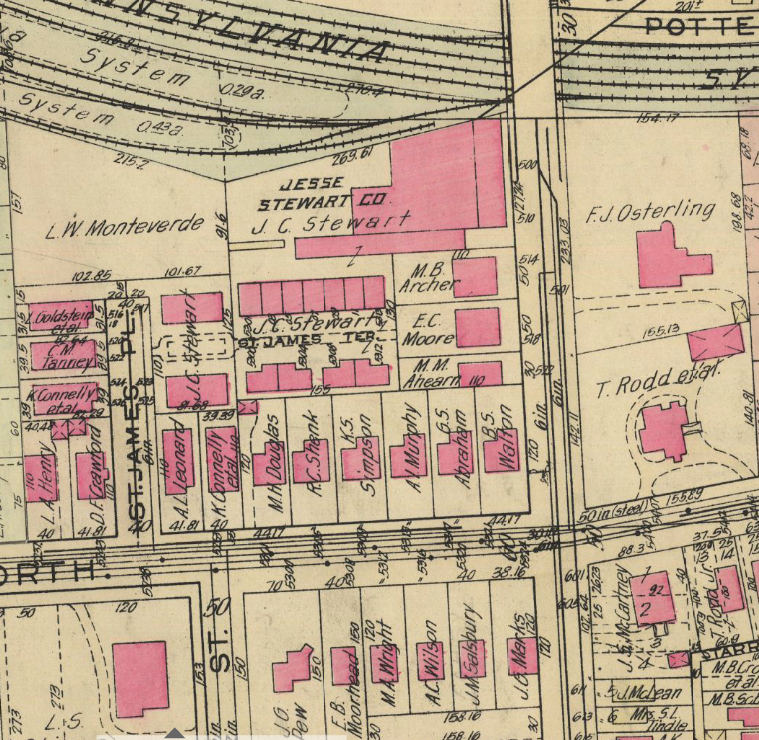 The two home fronts visible at right in the foreground were part of the Jesse C. Stewart Company property visible in the 1923 map below. In the map, there is a split sidewalk that goes between the two buildings which merges to a single sidewalk through St. James Terrace. The layout remains the same to this day! The Jesse C. Stuart Company in Shadyside during 1923. South Aiken Avenue is a through street that runs vertically across the map at right. Ellsworth Avenue runs horizontally across the bottom half of the map. St. James Street connects with Ellsworth Avenue below and to the right of St. James Place. Map courtesy of Historic Pittsburgh, the Digital Research Library at the University of Pittsburgh. 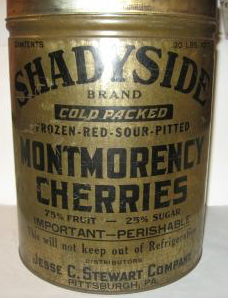 Shadyside brand cold packed frozen red sour pitted Montmorency Cherries from the Jesse C. Stewart Company. The Jesse C. Stewart Company opened its doors in Shadyside during the 1920s when the neighborhood was going through its most dramatic transition from a suburb to city neighborhood. The company ran a mill and was a supplier of a variety of agricultural products. The image at right shows a can of cherries packed and sold by the Jesse C. Stewart Company. The row houses along St. James Terrace and the two more substantial houses along St. James Place appear to have been built for employees working in the adjacent large brick building convenient to the Pennsylvania Railroad tracks and South Aiken Avenue. Today the building houses UPMC physician offices. The Jesse C. Stewart Company remained operational at its Shadyside location when the photograph above was taken in 1934. This entry was posted in Shadyside History on July 10, 2017 by don.